Christmas should be a time of joy and celebration with family and friends. 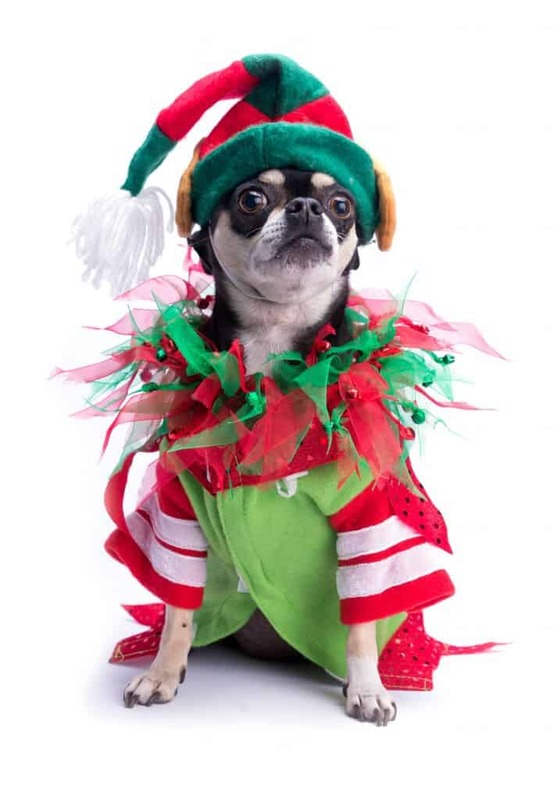 Households with dogs should take special precautions to assure a pet-safe holiday environment, especially for a small dog like your Chihuahua. Your time and care can help you avoid injuries and frantic, expensive trips to the vet. 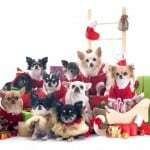 Even a small holiday tree dwarfs your Chihuahua and could cause your dog serious injury in a tip-over accident. To reduce temptation, set up the tree in a corner of the room. Anchor it with fishing line wrapped around the trunk and secured to eye bolts screwed into the walls or ceiling. If you choose a live tree, select one that’s fresh, with green needles that bend rather than break. Replace the water at least once a day to avoid bacteria buildup. Cover the tree stand so your dog can’t drink from its reservoir, avoiding the ingestion of pine sap, antifreeze, preservatives, or fertilizers that leach out of the trunk. 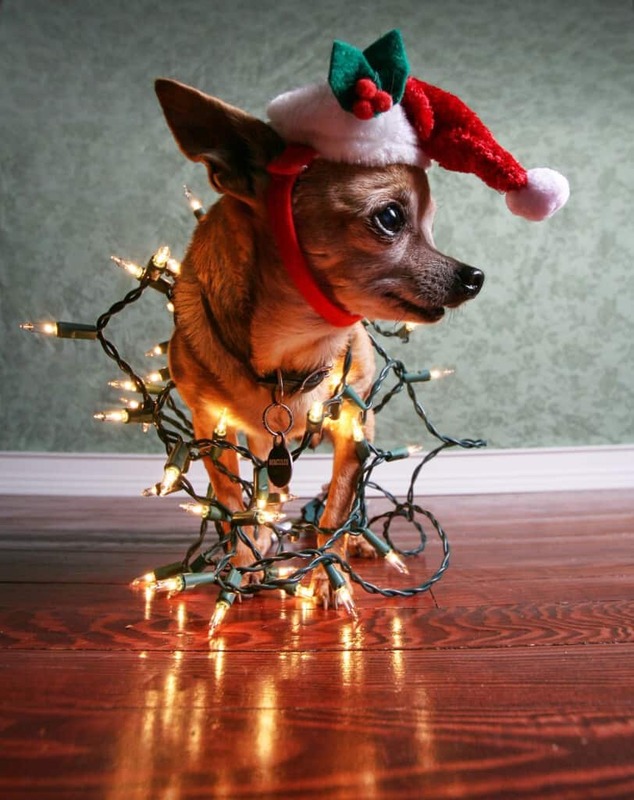 Evergreen needles can puncture intestines if your Chihuahua ingests them, so keep the area tidy. Skip the tinsel. Dogs nibble on these shiny metallic garlands, which can cause intestinal blockages that require emergency surgery. Chewed-up ornaments also can cause blockages or worse, if they shatter into sharp pieces of glass or plastic, or include batteries that can cause poisoning. 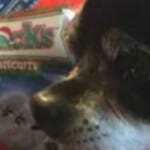 Edible decorations, such as popcorn or cranberry strings, tempt your dog to munch. For safety’s sake, keep ornaments off the lower part of your tree unless they’re battery free and impossible to break or chew. Tree lights also pose hazards. 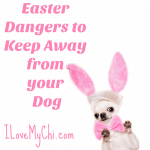 Your Chihuahua can become tangled in the wires or get an electrical shock from chewing on them. Leave low branches unlit to protect your dog. 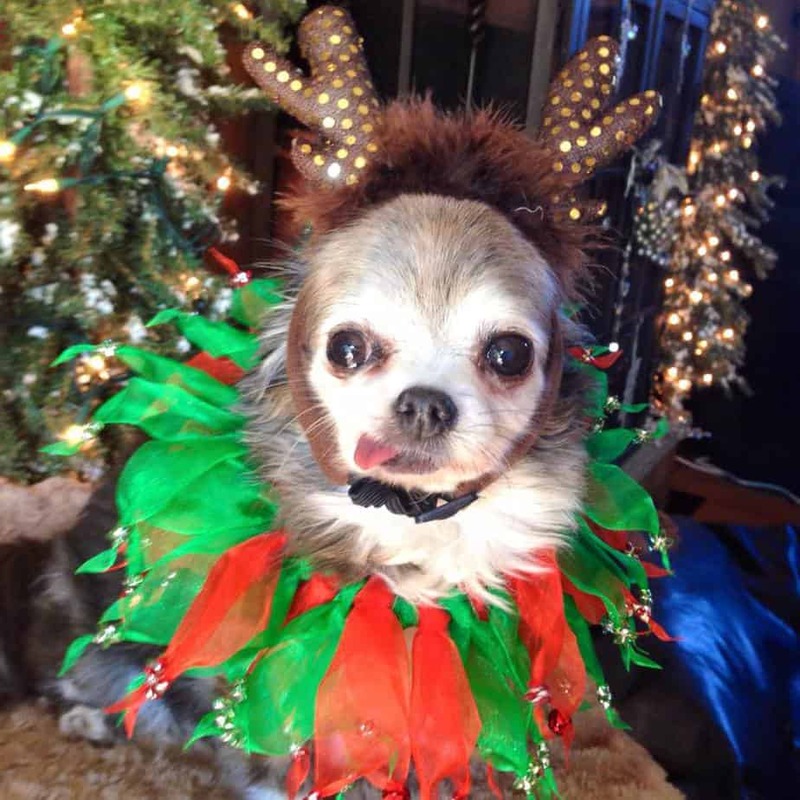 Some traditional Christmas plants can cause illness or even death if your Chihuahua ingests them. Mistletoe, holly, poinsettias, lilies, and roses can cause reactions such as heart problems, digestive upset, nausea, vomiting, diarrhea, and kidney failure. Some potted plants include cocoa mulch, which carries the same canine health warnings as chocolate, one of the top items on the list of food dangers. If you must decorate with plants, place them well out of your dog’s reach, or choose artificial foliage. 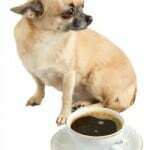 Chocolate, onions, raisins, alcohol, coffee and coffee grounds, and the sweetener xylitol can be toxic to your dog. Leftovers can contain bones that splinter in the digestive tract, along with lots of fat and spices. Yeast dough can cause a health emergency if it rises inside your dog’s body. Never leave food unattended while you’re cooking, serving, eating, or putting away leftovers, and remind guests and family not to give your Chihuahua table scraps. If you live in an area that experiences real winter weather, watch out for ice-melting salt and de-icing chemicals, which can irritate paw pads and cause illness if your dog licks them off. 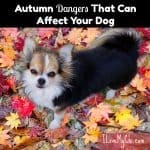 Coat your Chihuahua’s paws with a dog-friendly salve, invest in a set of dog boots, or plan on a paw-washing session every time you return from a walk. Always dress your dog in suitable winter gear, and limit exposure to the cold to avoid hypothermia, which can be fatal. Between a houseful of guests and entertainment sources such as the TV or stereo, holiday revelry can exceed your Chihuahua’s comfort threshold. A compression garment designed for noise-averse dogs may help lower the stress level, but you’ll also need to ask for quiet if things get out of hand. The Christmas holidays involve many traditions that depart from your regular household routine, but that doesn’t mean you shouldn’t maintain your dog’s daily schedule. Keep walks and feedings on time, and don’t skimp on play or attention. 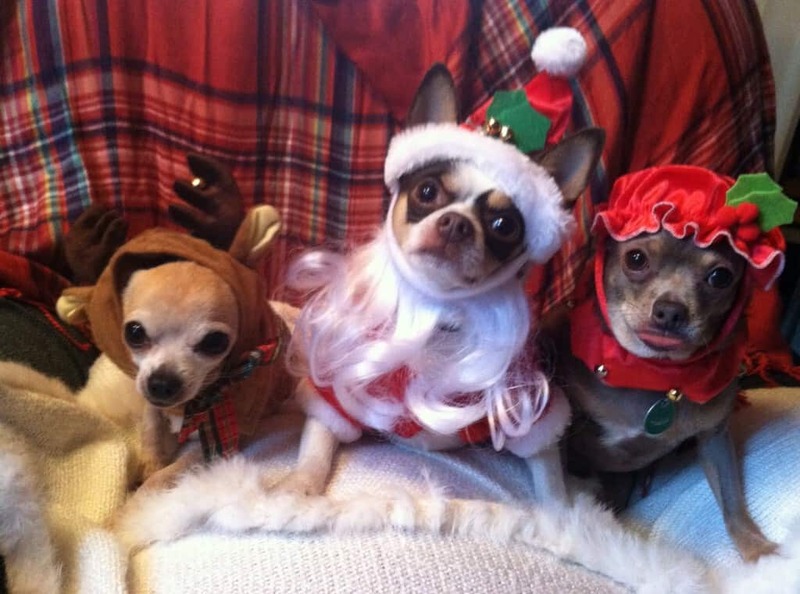 If your Chihuahua feels left out, you may be faced with a cranky dog. Especially if friends or family are staying with you, give adults a reminder about keeping medicines out of your dog’s reach, and avoiding situations that can tap into or trigger bad behavior. Children, particularly little ones, may overexcite or manhandle your Chihuahua. Plan on monitoring interactions and intervening if you see a child treat your dog like a pull toy. With people running in and out to pick up last-minute gifts and bring in luggage or presents, the doors to your home will get a workout. 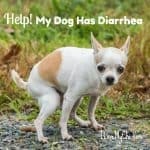 To forestall your Chihuahua from making a break for the outdoors, remind family and friends to watch out for the dog and take steps to avoid escapes. If your dog is crate trained, you can simplify your routine accordingly. To eliminate hazards, look at your home from the vantage point at which your dog sees it. Get down on hands and knees to simulate a dog’s-eye view, or use a sports-and-action camcorder to capture the scene. Evaluate what you see to rule out risks that you otherwise wouldn’t notice. The time you spend dog-proofing your celebration will pay off with peace of mind for you and your Chihuahua. Have a happy holiday together!